You Don't Have An Internet Marketing Plan? What a Dummy! There’s nothing like slamming into a concrete wall at 35 miles per hour. Or getting hit from the side with enough force to rip the limbs from your body. It’s such a thrill. The crunching metal, the breaking glass, the exploding airbags – it all contributes to the experience. 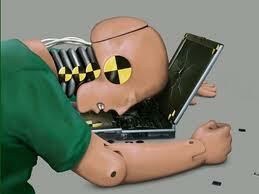 Do you feel like an Internet Crash Test Dummy because your business is not generating leads and producing money? Internet marketing has become somewhat of a buzz phrase. Everyone wants to do it, but not everyone is succeeding with it. In order to succeed at Internet marketing, you need to know what techniques to use and what tips to follow. You need an Internet Marketing Plan. Here are six solid tips to get your Internet marketing plan successfully underway. Internet Marketing Plan Tip 1. Focus on paid advertising, search engine optimization (SEO), or social media marketing. You can do all of them at one time or another, but stick with one campaign at a time. Stay focused!!! That way you can put all your efforts into making one campaign work without distractions or side projects. Decide what you have the budget for, and which campaign you understand best and can do the easiest. Internet Marketing Plan Tip 2. Target one market and stick with it. You might want to say that your business appeals to all people everywhere, and it might be true, but for the sake of your sanity and your business efforts, it is smart to hone in on one target group. That way, you can get to know them. You can know which social media sites they use, what forums they frequent, what questions they are asking, what they want, and what they need. Once you know those things, you can point out the ways that your product meets their requirements or more importantly you can blog about the steps to take to resolve their problem. Internet Marketing Plan Tip 3. Get specific about the information you share with prospective customers. Let them know exactly what they get when they deal with you, and be specific about how your product works and the results that you experienced. Tell them exactly how to use your product, and how your product can solve their problems. Video is an excellent way to demonstrate your product or solution. By being specific in this way, you put their mind at ease about buying your product. If you leave nothing to guess about, you put them in the right mindset to confidently buy. Internet Marketing Plan Tip 4. Be yourself at all times. Most people would advise you to be professional but I think that is BS (bad system). The Internet values creativity and realism. Look at the rise of YouTube. People love crazy videos. They treasure a moment of laughter or diversion from the troubles of the day. I do not suggest being “wild and crazy” if that is not who you are. I am suggesting that you be “real”. The Internet can be a curious place for those who own businesses. Let your real self come out. People will appreciate it. Internet Marketing Plan Tip 5. Make a website that is easy to navigate and built for selling. If you don't know how to do this yourself, this might be a time to call a professional or for a small amount of money there is effective but fun training that will help you improve your website. Check out this free training from the SEO Madman. After all, your site is similar to your storefront; if your front window is cluttered and dirty, no one will come in. Likewise, if your site looks too busy and is hard to find what someone wants, no one will come back. Internet Marketing Plan Tip 6. Go to other blogs and sites and learn as much as you can. Go to your competitor's sites and see what they're up to. Go visit blogs in your industry to see what people are talking about. Keep reading up on marketing principles. As you can see, Internet marketing plan success is oftentimes dependent on focus and concentration. Use the tips here to educate yourself on how your Internet marketing plan can be a success, and you'll see positive results eventually. But if you REALLY want a Step-by-Step, Simple System with huge success potential…. that you can feel good about…. …sell products even when prospects do not join your network marketing business…. If so, go here and see why all of the industry leaders have used this system …..
…and how YOU can start having some of that same success…. ASAP.